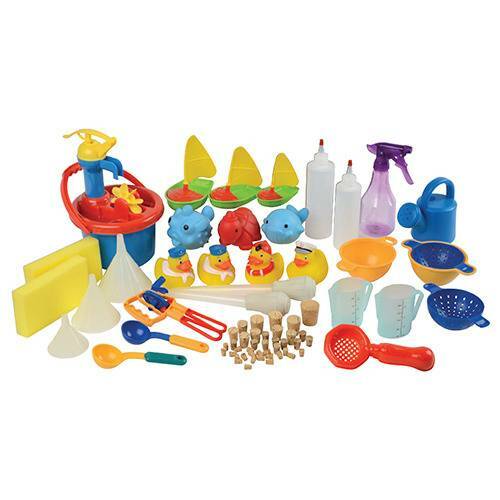 An all inclusive kit that includes 3 sailboats, 4 rubber ducks, 1 bucket with pump and waterwheel, 3 sea animals, 1 watering can, 3 sieves, 2 bowls, 2 ladles, 1 eggbeater, 2 basters, 2 measuring cups, 3 funnels, 2 squirt bottles, 1 spray bottle, 2 sponges, and 20 corks in a pvc storage bag. Ages 3 yrs. +.